Situated right at the confluence of Potomac and Shenandoah Rivers, our location is ideal to ensure you have the proper gear for whatever you might be fishing. White Fly Outfitters has the street credibility of specialists on Smallmouth Bass that dominate our River systems, but we also fish for and carry Rods, Reels, Gear, Flies and Tackle that target Trout, Walleye, Musky, Carp, and Panfish. White Fly Outfitters originally opened its doors as Kelly's White Fly Shoppe in 2006 in Shepherdstown, WV. Owned and operated by Bryan Kelly, the shop specialized in fly fishing and light tackle for smallmouth bass and other species on the Potomac and Shenandoah Rivers. 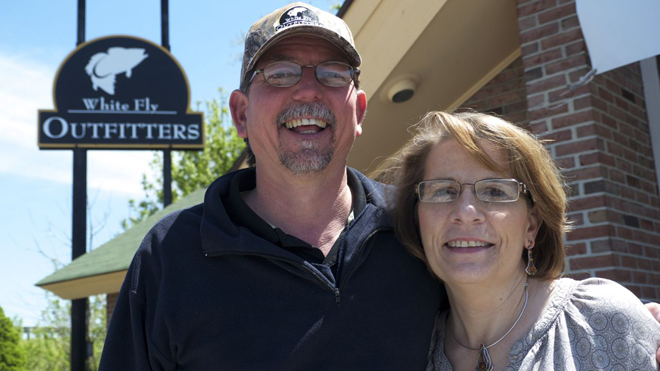 In 2012 Kelly's White Fly moved to our Harpers Ferry location and reopened as White Fly Outfitters to provide better access to the rivers and expanded space for growth in fly fishing and light tackle, fly tying and fishing kayaks. Bryan and his wife, Debbi also own and run The Angler's Inn, a bed & breakfast in old town Harpers Ferry, where they have lived since 1996. If he’s not at the counter of White Fly Outfitters, Bryan along with the other WFO Guides are on the scenic Potomac or Shenandoah sharing their experience with clients chasing big, beautiful bronzebacks, pound for pound the best fighting fish in the mid-Atlantic. Whether you are visiting or local, we’ve got the tools that work on these rivers, come on in, we’ll hook you up- Better Flies, Better Fishing! Love Fishing? Don't forget to subscribe to our YouTube channel!